Here are some of the Ubuntu 14.04 tweaks I’ve found and took note of. I didn’t invent or figure out any of these things (so don’t give me credit). I just googled and then used them and took note of them so that I could use them in the future. I no longer know where I found any of these so I’m sorry I’m not linking to the real source. Hopefully someone else will find these useful too. 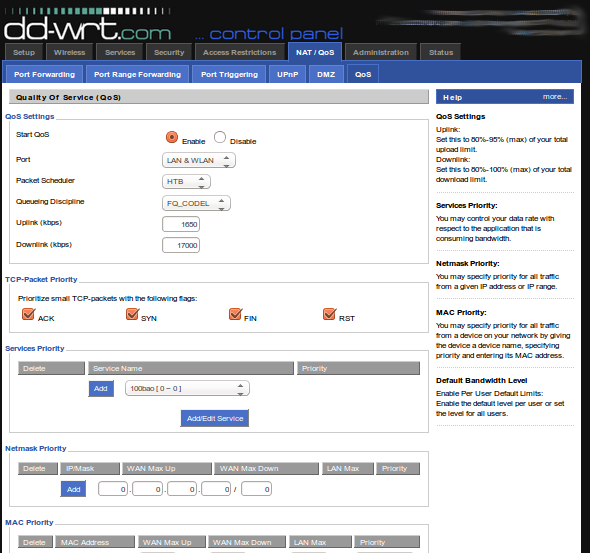 A few days ago I installed the DD-WRT firmware on my Netgear WNDR4300 Router. This router was pretty good but the Quality of Service functionality was lacking. I decided to try a switch to DD-WRT since I read on the web that it was possible. This guy’s blog post describes the process very well so I followed his lead. First I downloaded the img file from going to the dd-wrt site and searching the router database. Then I downloaded the img file and uploaded it to my router. After the install I refreshed the page and the dd-wrt software came up! Easy! Then I tried to configure QOS. I set mine up by MAC address so it took some work to compile the list. We have a tone of devices connected to wifi in my house at any one time: ereaders, phones, pcs, game systems, oh my! I first started by adding all the MAC addresses into the list but quickly realized that only the high priority devices need to be listed. I listed my phone (for VOIP calling), our whole-house magicjack and my work and personal computers as higher priority devices: I set the 2 voip devices as Premium. I set my 2 computers at Express. My kids game systems and ereaders will all be set at Standard by default. This setup seems to work OK so far (after only a day or two): OK, now for the bad news. After googleing around and a fair amount of experimentation I discovered that UPNP or static port forwarding DO NOT WORK with QOS on DD-WRT firmware. So you have to pick which one you want more. This really stinks because I need both. Xbox requires UPNP or static forwarding. For now I’m using QOS but I might have to disable it to allow Xbox to use upnp. If anyone knows how to get UPNP or static port forwading to work with QOS on DD-WRT please leave a comment. If anyone knows of a router that can do both QoS and Port Forwarding well and at the same time, please leave a comment. As soon as I enable QOS, my port forwards stop working. Yesterday I setup encrypted folders using Ubuntu 14.04 LTS (32bit). First I used CryptKeeper and then I switched to Gnome Encfs Manager. Then I installed CryptKeeper from the Ubuntu Software Center. CryptKeepr was sketchy. Sometimes the toolbar shortcut was there. Sometimes it wasn’t. Gnome encfs manager has more options and seems to just work. It will mount your encrypted directory wherever you like (configurable). When you try to mount it it asks your for a password. You type it in and tada! Encrypted dir! I recently bought a Brother MFC J825DW all-in-one printer/scanner/copier/fax machine. This is a wifi enabled printer so it made it possible for me to put the printer downstairs in the same room where we keep the kids’ computers. Now I don’t have to hear the loud printing noises in the middle of my work day. My wife is in school so she prints a lot – hundreds of pages of coursework for her classes. I was sick of leaving the room while I was on the phone to avoid the loud printer noises. Now the printer is downstairs closer to her and I am no longer tethered to the printer. Ink is cheaper than my old HP and there are generic suppliers that make Ink VERY cheap. I’m not sure they work yet but I’m hoping they do. Print quality is just OK when on draft mode. Draft mode and fast printing is fast and faded because it uses less ink. I’m OK with the draft quality but I wish it was just a tad bit better. Nothing to complain about though. The printer doesn’t have any lights to tell you it is on – but it is on. A tiny led would have been nice – but I don’t mind now that I know it is on even when not lit up. The printer is more quiet than my old HP. I could hear the old HP from downstairs. This printer I cannot hear from upstairs. Sometimes I can barely hear it from the next room. I recently switched to Ubuntu 12.04 for three of my computers (my lenovo g580, my son’s hp desktop and my other son’s dell laptop). I had a very hard time making the switch because I ran into troubles with 13.04 not working for wifi on my Lenovo g580 or the 12.10 nvidia drivers not working on my son’s HP Pavilion a1540n desktop. Then I accidentally installed a 32bit version of 12.04 that I had on CD. I thought it was a 64bit version but it was a 32bit version. It worked like a charm all around. It solved my nvidia problems on the desktop and my wifi problems on my g580 laptop as well. So nice. Now I run RHEL 6.4 on my work laptop and Ubuntu 12.04 on my personal laptop, my son’s HP desktop and my other son’s Dell laptop. My wife’s netbook is the only one left in the house running Windows (Windows 7) – Yay!